Protest February 28 of several thousand in Phoenix, Arizona, for immigrant rights and against targeting of immigrant workers by Maricopa County cops. 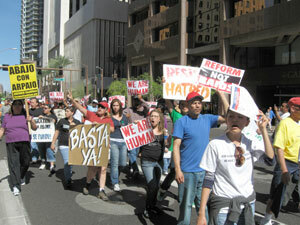 PHOENIXThousands of demonstrators marched through downtown Phoenix February 28 in a spirited protest demanding a halt to sweeping anti-immigrant raids that have been organized here and in surrounding areas by the Maricopa County Sheriffs Office. Marchers waved signs reading We are Human! and Arpaio: terrorista and chanted Si, se puede (Yes, we can); Arpaio escucha, estamos en la lucha (Listen Arpaio, were in the struggle); and No more Joe! Joe Arpaio is the county sheriff. Starting with more than 1,000 at the gathering point, the ranks of the march swelled as people joined in along the four-mile route and crowded the plaza for a rally at the Federal Building. Sheriff Arpaio drew nationwide attention on February 4 when he forced more than 200 Latino prisoners to march through the streets of Phoenix before TV news cameras, in shackles and prison stripes, from the jail to a tent prison set up to detain immigrants in the desert. Outrage against this helped galvanize activists in a coalition of organizations, including Somos America, Tonatierra, Puente Arizona, and Arizona ACORN, to organize the February 28 march. The National Day Laborer Organizing Network and other organizations helped build the action in other cities. As a result of these efforts, hundreds of protesters came from throughout the West. Zack de la Rocha, lead singer for Rage Against the Machine, marched at the head of the demonstration and spoke at the rally. He and other speakers condemned Apaios deputized vigilantes, the so-called volunteers that have been deputized as federal immigration agents by Arpaio to terrorize immigrant communities. Many in the area refer to the deputies as Arpaios posse. They are armed and some wear ski masks to hide their identity while making arrests. Many marchers expressed relief and satisfaction that, after witnessing these abuses over the course of several years, they were now able to be part of a large demonstration in opposition. Layal Rabat, a student at Arizona State University, came with two friends. She said she wanted to protest the mistreatment of prisoners in the jails, pointing to the case of a woman who gave birth to a stillborn baby after being refused the necessary emergency care. Arpaio, who has been sheriff since l992, faces numerous lawsuits stemming from abusive treatment of prisoners. Salvador Reza, one of the central organizers of the February 28 demonstration, told the Militant that building on the success of the action, he hopes the movement against the raids can be strengthened nationally. Arpaios posse, he points out, is a threat not only to immigrants but to any worker who plans to go on strike or organize a union.